I’m glad you’re looking at GarageBand in Mac 101 because I’m hoping you can answer a question that’s been bugging me for awhile. In GarageBand I want to record a duet with my partner using two USB microphones but I can’t figure out how to do it. Is it possible? It is, but the initial configuration happens outside of GarageBand. It works this way. Plug both USB microphones into your Mac, venture to the Utilities folder (/Applications/Utilities) and launch Audio MIDI Setup. In the bottom left corner of the resulting window click the plus (+) button and choose Create Aggregate Device from the menu that appears. Creating your aggregate device in Audio MIDI Setup. Launch GarageBand and create a new project—one with two audio tracks, for example. Choose GarageBand > Preferences > Audio MIDI. 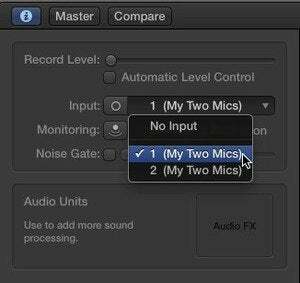 From the Input Device pop-up menu choose the two-mic setup that you created in Audio MIDI Setup. Close the Preferences window. Choosing the aggregate device in GarageBand's preferences. Select the first track and click the Smart Controls button (or press the Mac’s B key). In the Smart Controls pane below click the Info button. 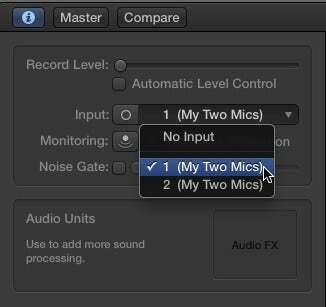 From the Input pop-up menu that appears, select the first of your two microphones. Now select the second track and in its Info pane choose the second microphone from the Input pop-up menu. GarageBand is now ready to record from each microphone. Assign your mics to the appropriate tracks. To complete the picture, choose Track > Track Header > Show Record Enable Button. In the header of each track you’ll now see two reddish buttons. Click each one and press GarageBand’s Record button. And done. Esoteric though this technique may seem, it’s not just for musicians. If you’re a mobile podcaster looking for a way to avoid passing around the mic when recording an episode from your MacBook, keep this in mind.